This document is the draft the Coalition proposed to legislators. They went ahead and filed legislation to achieve the same end goals. See http://stopbullyingcoalition.org/ombuds for information about two new bills as filed. The Tenant Protective Services Agency shall investigate and seek to remedy instances of bullying, mobbing, institutional bullying, and hostile environment harassment that target residents of public or subsidized multifamily housing for the elderly and disabled. The Agency shall recommend action by the Attorney General or the District Attorney to hold landlords accountable in situations of institutional bullying or hostile environment harassment. The Agency shall carry out programs of education and training for landlords, managers and staff, residents, and service professionals including all mandated reporters, the public, as well as attorneys and judges who may be involved in enforcing this law. The Agency shall undertake programs of research, evaluation, and development including by supporting innovative pilot and demonstration programs and shall publish the findings and results towards developing a collection of best practices. Please do not hesitate to share any concerns or suggestions to improve this bill. Kindly contact the Stop Bullying Coalition at stopbullyingcoalition.org/contact and/or the sponsors, Senator Joan B. Lovely and Representative Bradford Hill. ”Bullying,” any mode of action or communication used by one or more perpetrators to hurt, demean, or inhibit the target in an effort to wield inappropriate control over the victim. Bullying tactics include aggressive psychological and/or social methods to threaten the target, as well as actual or threatened harm to the person of the target or to their property. Bullying is a component of mobbing, institutional mobbing, and hostile environment harassment. “Covered residential situation” includes public and subsidized multifamily housing communities for elderly and people with disability. “Group bullying” consists of two or more perpetrators, who may include tenants and/or the landlord or their agents, using bullying tactics against one or more targets. “Hostile environment harassment” is unwelcome conduct creating a situation that makes it difficult or impossible for victims to have the peaceful enjoyment of their residency. “Hotline,” a 24/7 system managed by the Agency for receiving timely reports from mandated reporters and the public, consisting of a monitored telephone line, a monitored email address, and a monitored postal service address; with staff trained to take complaints, evaluate them, and promptly send on to a regional or local protective service agency or agencies for rapid investigation, evaluation, and action. “Residential community mobbing” consists of the landlord and their agents participating in, condoning, or ignoring bullying or mobbing of one or more targets. “Landlord” or “housing provider,” in public housing it is the local housing authority or other entity that owns and/or controls the multifamily residential facility and all their agents, including management, staff, resident service coordinator, social worker, and contractors. In privately owned, subsidized housing, it is the owner and all their agents, including management, staff, resident service coordinator, social worker, and contractors. “Local protective services agency,” the regional or local agency designated by the Agency to provide investigative and reporting services. “Mobbing,” is bullying by peers and/or the landlord and their agents resulting in inappropriate control of one or more targets and may include mobilizing members of the residential community against the target(s); tactics include using malicious gossip, social pressure, and isolation against one or more targets. “Peaceful enjoyment” also called “quiet enjoyment,” is the right of each tenant to enjoy the use of their home and common spaces without interference. Bullying, group bullying, mobbing, institutional mobbing, and hostile environment harassment infringe on the right to peaceful enjoyment. This right of peaceful enjoyment creates a legal obligation for the landlord to protect from bullying all tenants, their relatives, their visitors, and persons providing services to the tenant, including personal care attendants, social workers, and medical personnnel. “Perpetrator,” any person or group who uses bullying tactics. “Protective service agency,” the Agency and other agencies or contractors that provide services which are necessary to prevent, eliminate, or remedy the effects of abuse, bullying, harassment, mobbing, and hostile environment harassment on an elderly person or a person with disability. These shall include mental health, support and advocacy services, and community organization services as determined by the Agency. “Public housing,” multifamily housing that is owned and managed by a local housing authority and is overseen and/or supported in whole or part by the Commonwealth through the Department of Housing and Community Development. Some public housing is funded through HUD. “Subsidized housing,” multifamily housing that is privately owned and is supported in whole or part by payments, tax incentives, and other inducements provided by HUD, MassHousing, or the Commonwealth in order to encourage landlords to provide affordable housing and to provide subsidies to tenants directly (Section 8) or pay to landlords the difference between market rate and the reduced amount paid by tenants based on their income (project based). “Target” or “victim,” the person or group who is abused, bullied, or harassed. “Tenant,“ all residents residing in a covered residential setting, as well as their guests and personal care attendants; and caregivers who live with them. “Tenant Protective Services Agency” or the “Agency” refers to a new or existing state agency with the mandate and powers of this bill, and all subsidiary or contracted agents. It may be a new department under the Executive Office of Health and Human Services; under the Executive Office of Housing and Community Development; or a stand-alone administrative commission (like Mass Commission Against Discrimination (MCAD) or Disabled Persons Protection Commission (DPPC)). A statewide ombudsperson is another possible entity. Create and fund the department or administrative commission. Mandated reporters shall include: Any landlord of a covered residential facility and all their agents including the executive director or manager; the executive director at centers for independent living; the executive director of any Aging Services Access Point (ASAP); members, staff, and volunteers of a municipality-based human rights group or commission; any physician, physician assistant, medical intern, dentist, nurse, family counselor, probation officer, social worker, policeman, firefighter, emergency medical technician, licensed psychologist, coroner, registered physical therapist, registered occupational therapist, osteopath, podiatrist, executive director of a council on aging, outreach worker employed by a council on aging, executive director of a licensed home health agency or executive director of a homemaker service agency. A mandated reporter who has reasonable cause to believe that a tenant in a covered residential setting is suffering from or has died as a result of bullying or abuse, is being forced to leave or has been forced to leave their residence by fear caused by bullying or mobbing, or has been evicted or is being threatened with eviction that may be caused by bullying or mobbing shall immediately make a verbal report of such information or cause a report to be made to the Agency and shall within forty-eight hours make a written report to the Agency. Any person so required to make such reports who fails to do so shall be punished by a fine of not more than one thousand dollars. 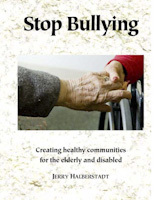 Any person may file a report if they have reasonable cause to believe that an elderly or disabled person is suffering from abuse by bullying or has died as a result thereof, or has been or is threatened with unfair or illegal eviction, or is experiencing hostile environment harassment. No mandated reporter or other person making a report shall be liable in any civil or criminal action by reason of submitting a report if such report was made in good faith; provided, however, that no person who abuses or bullies a targeted person shall be exempt from civil or criminal liability by reason of their reporting such abuse. Any person who shall make a malicious and false report shall be punished by a fine of not more than five hundred dollars. Any person who seeks to prevent good faith reports or to retaliate against a person who makes or assists another in making such a report, shall be punished by a fine of not more than five hundred dollars. A victim of such interference or retaliation may file a complaint with the Agency in the same framework as reporting bullying, and shall be protected by the Agency and the court from further retaliation. The Agency shall establish a hotline service for receiving timely reports from mandated reporters and the public. The hotline service shall consist of 24/7 monitored facilities, including telephone lines, online forms, and email address; with staff trained to take complaints and send on to the local protective service agency for rapid evaluation and action. Upon receipt of a report of bullying, mobbing, or hostile environment harassment of an elderly or of a disabled person, the Agency shall promptly assign an investigator to evaluate the allegations and take immediate steps to protect the rights, health, and safety of the target. The Agency, on finding that a covered residential situation is characterized by institutional mobbing or hostile environment harassment as defined by criteria for referral, shall report the case to the Attorney General or District Attorney and recommend investigation and possible legal action to provide protection for the residents by holding the landlord accountable to assure peaceful enjoyment for all tenants. The Agency shall work together with the Attorney General to determine and publish appropriate criteria to identify hostile environment harassment and institutional bullying. The Agency shall assess and evaluate the information reported pursuant to the provisions of section this bill. Such assessment shall include a visit to the residence of the person who is the subject of the report and may include consultations with appropriate service agencies and individuals who have knowledge of the person’s situation including the person filing the report. Insofar as possible, the investigator shall evaluate the alleged perpetrator(s) to assess the risk to the target and confirm that the victim is not making a false claim. The person who is the subject of the report shall receive written notice that an assessment is being conducted and shall have the right to review the file and report developed as a result of the assessment. If the assessment results in a determination that the person is suffering from bullying or abuse, the Agency or the designated agency shall evaluate the person's functional capacity, situation, and resources and shall develop a service plan for the provision of protective services. Said plan shall be appropriate to the needs of the person and shall utilize the least restrictive alternatives. Further, the Agency shall evaluate the functional capacity, situation, and resources of the perpetrators and shall develop a service plan appropriate to the needs of the person consistent with eliminating bullying, and if the bullying behavior is the result of disease or mental incapacity, to offer appropriate resources and treatment. The goal shall be to assure that no person is diminishing the rights and peaceful enjoyment of others. The Agency shall encourage the landlord to develop and implement a plan for rapidly ending the bullying or abuse. The Agency shall adopt rules and regulations establishing time limits for the completion of assessments and evaluations and for the implementation of service plans; provided, however, that if an emergency exists, assessments shall be completed within twenty-four hours of the receipt of the report. If an assessment results in a determination that the victim of bullying has suffered serious abuse, the Agency shall report such determination to the Attorney General or to the district attorney of the county where the abuse occurred within forty-eight hours. The Attorney General or the district attorney shall investigate and decide whether to initiate civil proceedings. (b) The Agency shall provide or arrange for protective services in accordance with the service plan. Protective services shall include, but not be limited to, the following: the capacity to respond to an emergency; protective services case work; the capacity to provide or arrange for a homemaker, home-health aide, transportation, legal assistance, counseling, nutrition services, guardianship and conservatorship, protective order through the court, emergency shelter, foster care, and adult day care services. The Agency is authorized to arrange for additional services necessary to assist and protect persons who have been abused, including, but not limited to, the following: medical care, mental health care and emergency financial assistance. Any person who requests or affirmatively consents to the receipt of protective services may receive said services. If the person withdraws or refuses consent, the service shall not be provided or continued. No person shall interfere with the provision of protective services to a person who requests or consents to receive such services. In the event that interference occurs on a continuing basis, the Agency or a protective services agency may petition the court to enjoin such interference. The Agency shall provide appropriate training to investigators and other staff as well as contractors who may be involved in the investigation, evaluation, and interventions related to bullying. Training and educational programs shall cover all relevant agencies, the courts, and all who work or live in covered residential situations. The Agency shall promote awareness of the hotline and the right to submit reports through a public relations campaign and campaigns directed to reach landlords, managers, staff and tenants in all covered residential communities as well as all mandated reporters. The Agency shall support a program of research to identify residential multifamily programs that are effectively lacking in bullying, compare them with programs that have extensive bullying, and identify the factors that may account for those differences. The effective programs may show ways to achieve prevention and remediation in multifamily housing. Based on such understanding of best practices in multifamily housing, to support demonstration and pilot programs. These programs may be adapted to local needs and conditions, and shall be monitored to evaluate their progress. The impact of the work of the Agency shall be evaluated and monitored through appropriate research by a unit sufficiently independent of the Agency operations so as to permit objective reporting. The results of these research, development, and evaluation efforts shall be carefully evaluated and reviewed to determine a range of best practices, which shall be promulgated as potential examples to all covered residential programs.